Young and charismatic though he may be, candidate of change or first potential black president, regardless of whether he's the far lesser of two offensive evils, there is no way I will vote for Barack Obama for president in 2008. None. Zero. What we agree on pales in comparison to where we differ, and on the two issues facing the world today that I care most about (Iran and Palestine), Barack Obama represents everything that I despise. So, all Kennedy endorsements and Hillary-bashing aside, I will not be able to pull the lever for Obama in November (or on February 5th for that matter). I remember, Amy—I knew Barack Obama for many years as my state senator—when he used to attend events in the Palestinian community in Chicago all the time. I remember personally introducing him onstage in 1999, when we had a major community fundraiser for the community center in Deheisha refugee camp in the occupied West Bank. And that’s just one example of how Barack Obama used to be very comfortable speaking up for and being associated with Palestinian rights and opposing the Israeli occupation. And just yesterday, he apparently sent a letter to Zalmay Khalilzad, the US ambassador at the UN, to urge the US not to allow any resolution to pass criticizing Israel and saying how Israel was forced to impose this barbaric medieval siege on Israel. AMY GOODMAN: Hillary Clinton, her view on the Israel-Palestine conflict, specifically also what’s happening now in Gaza? ALI ABUNIMAH: Again, we saw Hillary Clinton, the moment her political ambitions became pronounced, shift. You’ll remember, when she spoke in the 1990s in favor of a Palestinian state, since then she has become one of the most anti-Palestinian hawks. For example, a couple of years ago, she went and staged a photo opportunity in an Israeli settlement by the apartheid wall and talked about how the wall was necessary. This wall, of course, which has been condemned as illegal by the International Court of Justice, which has ordered Israel to tear it down, Hillary Clinton went and stood in front of it and endorsed it. And we’ve seen that time and again. John Edwards, the same, staunchly pro-Israel. On the Republican side, you have John McCain, who talks like a maverick on other issues, but on this one he has gone out of his way to offer full support for Israel. You have Huckabee, who is on the Christian evangelical right, that is historically not very friendly towards Jewish people, but is very strongly pro-Israel for reasons of biblical prophecy. And Huckabee, who is—according to a report in the Jerusalem Post, talked about a Palestinian state in Egypt or Saudi Arabia, so really talking about the forced transfer or ethnic cleansing of the Palestinians as a solution. That, unfortunately, is the level of discourse. And maybe it’s because there’s such a consensus in the mainstream on unconditional support for Israel, no matter how illegal its actions or how harmful they are to the United States, perhaps because there’s such a consensus, that’s why there’s no debate. ALI ABUNIMAH: Governor Romney, I haven’t heard his specific words, except that he has been particularly outspoken in claiming that Islamic militancy, of which he claims Palestinians are a part, is the greatest threat to the United States. And what we’ve seen is this debate happening, this discussion happening in a broader context, Amy, where many of the candidates, not just on the Republican side, whereas they claim to be running against Bush or at least away from Bush, have actually absorbed some of the basic tenets of Bush’s worldview, which sees the United States and the West engaged in this massive civilizational struggle against Islam. It’s a very dangerous and false idea. And many Muslims feel that they are now the targets of a hysteria, which is similar or has even become worse than the anti-communist hysteria of the 1950s, where Islamic militancy is under every bed and where any form of resistance, any form of resistance to US imperialism, to Israeli colonization and occupation, is defined as extremism. And there’s nobody who’s—you’re not even allowed to go and get food for your family from Egypt if you’re starving without being called an extremist, without being accused of militancy or terrorism. That’s level we’ve reached. No resistance is permitted, Amy. But what we’ve seen from Gaza and what we’ve seen time and again in Lebanon is that resistance will continue, that people will not quietly accept the fate that has been designed for them in the boardrooms of the Pentagon and the White House and the Defense Ministry in Tel Aviv. People will resist. U.S. presidential hopeful speaks to Jewish newspapers, Haaretz to dispel accusations of anti-patriotism. Democratic presidential hopeful Barack Obama said Monday that there is a "constant virulent campaign" being waged against him as he strives to win the party's nomination, aimed particularly at weakening support for him from within the Jewish community. Obama told Haaretz and writers from several Jewish-American newspapers that the campaign against him - calling him Muslim and accusing him of not pledging allegiance to the United States - is especially visible in the Jewish community. The presidential hopeful said he would ordinarily ignore such comments, but he fears that they have been "getting some traction" and are being tuned into by public ears. Thus he said, he has asked the Jewish newspapers and Haaretz to use their "megaphone" so people can hear "from the horse's mouth" that all such accusations against him are unfounded. With regard to his policy on Israel, Obama repeated his established position, which has already been distorted into countless different versions. 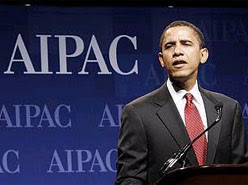 Obama believes in Israel "as a Jewish state." He does not accept that a right of return for Palestinians can be interpreted "in any literal way." He opposes talks with Hamas as long as the Islamist organization refuses to recognize Israel. And yes - he believes in a two state solution for two nations, but only as long as Israel has "security" that the Palestinians will not only sign a final agreement, but also actualize it. No state, he said, would accept the reality of rockets striking civilians on a daily basis. Until the security is returned, he said, it will be difficult "to move forward." Regarding Iran, Obama is in favor of the "carrot and stick" approach. While he supports continuing the sanctions, he still wishes to insist on reminding the Islamic country of the benefits it could be entitled to if it returned to the straight and narrow path.